New insights from science and behaviour change could lead to significantly improved outcomes, and at a lower cost, than the way many conventional policy tools are used, argues the UK Government. MINDSPACE: Influencing behaviour through public policy was a joint commission by the UK Cabinet Office and the Institute for Government. It shows how the latest insights from the science of behaviour change can be used to generate new and cost-effective solutions to some of the current major policy challenges, such as reducing crime, tackling obesity and climate change. 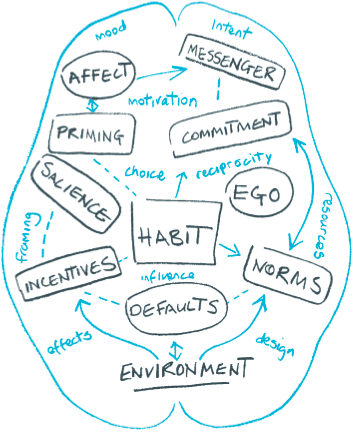 “Many of the biggest policy challenges we are now facing – such as the increase in people with chronic health conditions – will only be resolved if we are successful in persuading people to change their behaviour, their lifestyles or their existing habits. Fortunately, over the last decade, our understanding of influences on behaviour has increased significantly and this points the way to new approaches and new solutions.